How Can You Fix Ganache That Is Too Soft? I've made the chocolate ganache according to the recipe. I waited a whole day for the ganache to set. It's still too soft and sticky to roll into a ball! What can I do to make it firm enough? I've got quite an investment in chocolate and creme for 120 truffles! I don't want it to go to waste. Do you have any suggestions that might salvage my ganache? Thanks so much! Comments for How do I make too soft truffle ganache firmer? My dark chocolate - red wine truffle filling was too soft to hold it's shape for coating, even after freezing after scooping into smaller portions to roll. Powdered sugar would change the taste, so I put the chilled truffle filling (ganache) back into a pan over low heat and added unsweetened cocoa powder a TBLS at a time until the filling was considerably thicker. I then returned the filling to the chilling bowl and proceeded with the recipe. The flavor was unaltered and the truffles were saved. Did you try the suggestions offered below in previous posts to reheat, add some powdered sugar, etc? We don't really know what you have tried. Hello - when I do dark or milk chocolate ganache I use 250g chocolate and 1/3 cup cream. it works perfectly. However, today i wanted to make a white chocolate ganache with raspberries for a macaron filling - but it just didn't work! First it split and was so runny...finally got it to come back together but had to add icing sugar :( don't want to waste all the raspberries and choc, was expensive, but the ganache just wont harden now :( any ideas? I have a recipe that calls for 1/2 cup cream to 12 oz chocolate, as well as 1 tsp kayro syrup. If using white chocolate it calls for 10 oz chocolate. I never have a problem with it being runny and I do not refrigerate it. It sets up within an hour. I wouldn't put ganache in the freezer to set if I were you. It should be fine in the fridge and should set in a few hours. 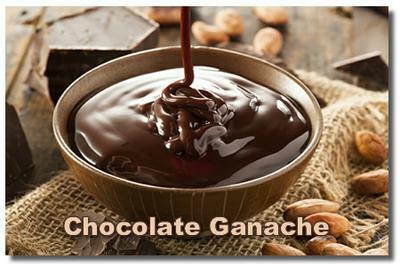 As for the ratio of chocolate to cream when making ganache, it depends on what you are using the ganache for. If it's for a thick ganache to roll for truffles, the ratio would be 2:1 in favor of the chocolate. Basically, that means you'd want 1 lb. of chocolate to 1/2 pound of cream. The measurement is by weight rather than volume. If you're using just a small amount of flavoring extract it shouldn't make a difference in the consistency, but if you now you are going to need a lot, you may need to add more chocolate to keep it firm enough. What is the appropriate time one needs to wait till the ganache is set for truffles in the freezer ? If the flavoring is liquidy, will that affect the consistency of my ganache? Also, what is the correct proportion of chocolate to heavy cream for ganache in truffle making ? I followed the teacher's instructions to the letter but my strawberry white chocolate truffle is too runny to form into a ball which I would then like to coat with dark chocolate. It's probably because runny truffle mixes like this one have to be made in molds, and Not hand-rolled, and this is of course a bit more tricky. So rather than add confectioner's sugar or any other thickener which will change the flavour no matter what you do, I'm going to add more white chocolate, a little bit at a time, and hope for the best. You could do that as a last resort, but why not try some of the fixes suggested? You probably just didn't get your cream hot enough. Even if you can't fix it by reheating or adding more chocolate and/or some powdered sugar, it should still taste great and yes, as cake frosting it would be decadent! I've never made truffles before and somehow found a recipe that called for both cream and butter, and now I've got a big bowl of chocolate icing. That's how loose it is. Should I just make a cake and use it for that? What do you mean by BHG truffles? The Better Homes and Gardens recipe? Anyway, I'm not sure why you think that the solutions offered above don't fit your situation. It sounds pretty much the same to me and you simply need to get your ganache to thicken. Try reheating it to a little higher temp and/or melt some additional chocolate into it. As a last resort, you could always add some powdered sugar to the soft mixture and thicken it that way. I've read all the answers above, but does not help my situation. I am trying to make BHG truffles. I have a mixture of Evaporated milk, sugar, peanut butter and marshmellows. I followed the recipe to perfection. It's supposed to firm up in 1/2 hr. to form into balls. It is like a marcharine consistency - no way able to make balls for dipping into chocolate. Any help would be so greatfully appreciated. I am a very experienced cook and I have tried twice now to make the Epicurious recipe of White Chocolate Green Tea Truffles. I used Ghirardelli chocolate and it will not thicken into a ganache consistency. Someone else wrote in and had the same problem but there is no chat available for this issue and no one answered the other person's issue. Could the proportions be wrong? 310 g. chocolate and 1 1/2 c. cream. thanks to anyone who knows. I will try the remedy here as suggested this time. As mentioned above, you can try fixing the ganache by slowly reheating it and stirring in more chocolate. Another option not mentioned above is to also stir in some powdered sugar to help thicken up the ganache. Be aware that you will be slightly changing the taste and texture, but it will still make nice truffles and salvage your ingredients. How do I fix ganache if it is too wet for molding? I'm not quite sure what you mean when you say that your chocolate "falls apart" when you try to make your truffle balls. Do you mean it is too crumbly or it is too soft or what? If you made the ganache by heating heavy cream to just before boiling point and then stirring in the chocolate to make a firm ganache, it should have worked okay unless you didn't add enough chocolate as mentioned above. I haven't tried reheating a ganache truffle mixture in order to add more chocolate and thicken it up, but I don't see why it wouldn't work. The main precaution is to be careful not to burn it when you reheat the mixture. This time, you don't really want to boil it. You just want to heat it enough to be able to melt more chocolate into the mix. When I roll my truffle centers, I just quickly roll them between the palms of my hands and plop them on a waxed paper lined tray to re-chill before dipping. I can't make my truffles into balls...how come? I made chocolate truffles with heavy cream last night...the recipe said to cover it with saran wrap and refrigerate it for at least 4 hours up to a week. Then remove from fridge and form into balls, refrigerate again for 15 min. and then roll balls into cocoa powder. Well, my problem is my chocolate falls apart when I try forming the balls. I've even tried a melon baller. What am I doing wrong? If you start with the correct balance of chocolate and cream there should be no real problem of it not firming up. I use 3/5ths chocolate to to 2/5 cream. There are variations to this but it's a good starting point. Boil the cream,stirring to make sure it doesn't burn; add the melted chocolate to the cream and mix. I prefer to melt the chocolate as this ensures I get no little lumps of unmelted chocolate. Allow to cool but not firm; at this point adding flavouring. I like using Bermudian Black Rum which is quite strong but imparts a lovely flavour. I leave overnight in the 'fridge and then work off; it handles quite well.